About "Curved surface area of cone"
Curved surface area of cone is the measurement of outer area,where the extension of bottom portion wont be included. Cone is a solid or hollow object which tapers from a circular or roughly circular base to a point. "r" and "l" stands for radius and slant height of cone. 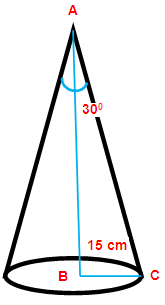 If the vertical angle and the radius of the right circular cone are 60 degree and 15 cm respectively,then find its slant height and curved surface area. Adjacent side (AB) = ? Hypotenuse side (AC) = ? here, we need to find the measurement of the side AC. So we have to use Sinθ. If the circumference of the base of the solid right circular cone is 236 and its slant height is 12 cm, find its curved surface area. A heap of paddy is in the form of a cone whose diameter is 4.2 m and height is 2.8 m. If the heap is to be covered exactly by a canvas to protect it from rain,then find the area of the canvas needed. The central angle and radius of a sector of a circular disc are 180 degree and 21 cm respectively. If the edges of the sector are joined together to make a hollow cone,then find the radius of the cone. The cone is being created by joining the radius. So the radius of the sector is going to be the slant height of the cone. Radius and slant height of a solid right circular cone are in the ratio 3:5. If the curved surface area is 60 Π cm², then find its radius and slant height. Radius and slant height of a solid right circular cone are in the ratio 3:5. Hence, radius and slant height of cone are 6 cm and 10 cm respectively. 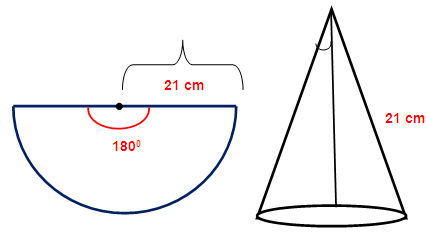 A sector containing an angle of 120 degree is cut off from a circle of radius 21 cm and folded into a cone. 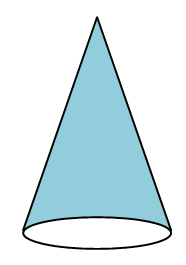 Find the curved surface area of a cone. Hence, CSA of cone is 462 cm².